I have been trying to understand this for a long time. Many of my closest friends are skiers and they make no apology for their vocal hatred of snowboarding and snowboarders. I believe that their reasons are based on “old school” ski culture (resisting change) and various unfounded beliefs about snowboarding (that were created to defend their unpleasant position). Background: I skied for 20 years before switching to snowboarding. I LOVE skiing, but after trying snowboarding for a few days I switched to snowboarding simply because it felt “right” to me. I honestly don’t feel any idealogical or cultural identity with snowboarding, I just like the sport. FACT: Skiing is faster than snowboarding. This is simple physics and imo accounts for a most of the problems on the mountain between skiers and snowboarders, as well as the higher death and injury rates of skiers over snowboarders. a. Aggressive/fast skiers and snowboarders alike, show off & taunt their counterparts (e.g. skiers taunt snowboarders, and snowboarders taunt skiers) because of the known cultural animosity. This is mainly done by passing closely at high speed (and noise) levels, often with snow spray. b. Skiers LOVE to pass snowboarders due to their clear speed advantage and tighter line. They just can’t resist the urge to show off their speed. 😉 Snowboarders probably do the same thing to skiers, but it happens less often (statistically) due to the skier speed advantage. c. Skiers and snowboarders have different “lines” and movement patterns which lead to more collisions. I hear this a lot and its true, but honestly, I think that its only a problem for beginner skiers and snowboarders. I have no problem managing skiers in front of me or in my line, mainly because they are moving faster. d. The average age difference between skiers and snowboarders is a primary factor in the cultural tension (mostly coming from the skiers who feel their storied traditions have been ruined by snowboarding). The fashion statement (slacker, sloppy, rebels, skulls) and showboat style of snowboarders riles old school skiers who don’t want to share “their” mountain with these new kids who don’t appreciate the history and blah, blah of skiing. 🙂 So, I believe this has less to do with the equipment and mechanics of the sport, and almost entirely due to age differences and resistance to change that old school skiers exhibit. In general, younger skiers AND snowboarders alike are generally less courteous, faster, and wilder than adults, but that’s not limited to the slopes. I firmly believe that this is a myth created by old school skiers that just don’t like sharing the mountain with snowboarders “renegades.” 🙂 If it were true, we would see large mounds of wonderful snow blown by the snowboarders off the sides of the trails… but we don’t. Also, consider that skiers have two edges with strong pressure on tighter lines and probably move as much snow (possibly more!) as the snowboarder. Lastly, even if snowboards do move more snow (doubtful! ), keep in mind that the snow is moved randomly across the run and MOST snow moves down due to gravity. I am open to scientific evidence that snowboarders “blow more snow off the runs”, but need more hard evidence. I believe that the myth is rooted on the observation that snowboards are wider than skis and “look” like they might blow more snow. I have skied for 20 years and then snowboarded for 15 years. I never hear snowboarders saying the ugly things about skiers that skiers say about snowboarders. This is a classic case of old school resistance to change– they feel that “their” sport and their mountain is being ruined by interloper upstarts (yawn) who don’t appreciate the fine tradition of skiing. And so it goes that they need to create myths to defend and justify their position (since its based on myth and false stereotypes). We can all share and enjoy the mountain together by using simple, common sense safety, friendly politeness, and forgiveness when people make mistakes (which happens frequently on the mountain). So, when skiers race by me at twice my speed within hands reach blowing snow on me and scaring the daylight out of me, I just try to chuckle, let them have their fun, and remember where I am. btw: I should note for the record that my politics have evolved dramatically over my life from devout Catholic, to apathetic youth, to idealistic communist, to Ayn Rand libertarian (10 years), to die-hard capitalist (10 years! ), to whatever I am now (independent, science-based, anti-party, anti-lobby, anti-tribe, pro-rationality, socially liberal, humanitarian, atheist, globalist). No complex system is perfect and all require constant refinement, refactoring, and the periodic overhaul. Supply-side economics, free market capitalism, and a free society are the foundations of American success. However, in the last 25 years: a) the policies of deregulation w/o a safety net, b) extremely costly wars and bloated military budget, c) Wall Street cronyism, and d) extreme electoral influence by a small number of people, have broken the delicate balance of our once great nation, and have created a national debt, electoral process, and social imbalance (i.e. declining middle class) that are untenable. And the good news is that the changes needed to return to balance are not radical overhauls (e.g. communism), but common sense, practical changes that re-factor a system that has spun out of balance. The basic tenets of free market capitalism and a free, social meritocracy are still the foundation. Moreover, to suggest that accelerating the current supply-side policies via MORE deregulation and privatization (i.e. dismantling government) without safeguards that protect citizens from industrial side-effects, appears to be based on simple stubborn ideology. Furthermore, blaming government and welfare families, cartooning liberals, chastising social security, and insulting immigrants–an undeniably strong element of the conservative position–has norationalbasis and unless I am mistaken, it’s an insidious tactic to scare conservative voters and create “target enemies” to distract attention from over-stepped, but theoretically sound, policies. Before you react, keep in mind that I–and the majority of liberals–am not suggesting that we shift towards Communism or any crazy ideas. Rather, we believe STRONGLY in a free market, free expression, capitalist meritocracy, and simply want to address the shortcomings that have developed in recent history. The conservative answer to our current disaster has been: “trust us, we’ll get rid of the big government–which caused these problems–and we’ll make even more money by getting regulations off our back, not pollute or poison anyone, let the “creators” (see Ayn Rand) rule the day, and when WE get rich, YOU get rich!” And as a big fan of free markets and capitalism, I find this argument shallow and frankly stupid. Milton Friedman established some of the core ideas that now embody the current conservative economic position. Specifically, his well-respected theories on the merits of “free markets” and less government intervention are the cornerstone of this debate imo. (Of course, he was not nearly as radical as today’s GOP position, but let’s agree that his ideas are foundational.) But, Mr. Friedman was also a liberal and an early Keynesian, and recognized that there were areas that government (or some authority) needed to balance the free markets and protect everyday people. So, my first question to you is: Do you agree that the deregulation reforms over the last 25 years enacted by Dem and GOP congresses/presidents are a major contributor to our current financial meltdown or not? Before you answer, I’d like to acknowledge that this alone did not cause the crisis; the two wars, gigantic military budget, lowered taxes, and globalization effects are certainly primary factors as well. Note: I believe that one of our core disagreement is what is the best way to ensurethatbusinesses don’t hurt people, i.e. regulation. The conservative argument has been that free markets regulate themselves because the economic system provides harsh feedback loops that discourage bad behavior and reward good behavior. I fundamentally AGREE that this is the best policy IFF its effective! However, over the last 25 years, the Dems and GOP have executed a dramatic systematic deregulation policy, BUT did not ensure that there were effective industry-based self-regulation policies in place. So, to be 100% clear, I am strongly attracted to the idea of self-regulation and trusting the markets, but it seems apparent to me that self-regulation (and even our current government regulation) has become a big joke. A good, albeit old, example imo is cigarettes: where was the self-regulation or self-correcting markets in this case? OTHER TOPICS WORTH EXPLORING: Influence of “lobby” groups on the electoral process, redistricting and voter fraud, immigration. 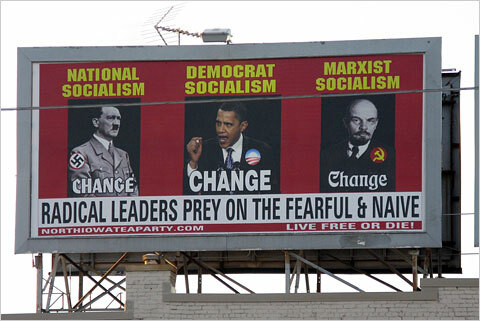 This is an actual billboard in Iowa, created by the Iowa Tea Party. This stuff really has me down. I wish I had some understanding of where this hate and despair is truly coming from. The number of people that feel this way–that Obama is the anti-Christ and that liberals are killing the country–is WAY out of bound with normalcy. It’s just too easy/lazy for the liberals to say “they’re all a bunch of rednecks and radicals” and dismiss them as stupid. Something else is happening here and we really need to understand it better (if we want to get our country back on track). Is it really as simple as jobs or race? One one hand, job loss does fuel the rage when people feel anxiety about income and job security; the pitchforks get raised and the government is blamed. But, something inside of me says that its more than that. And, there’s been lots of research that says its not about race (my other intuition). Note that the GOP was nearly as vicious with Bill Clinton, Hillary, John Kerry, etc. So, race probably is part of the issue, but not the deepest root. Did the liberals and democrats get this vicious when Bush started a war for the wrong reasons? No (but maybe they should have). I sense that something bigger and deeper is going on here and that it can only end in violence. Really. I honestly feel we’re closer to 1861 than most people realize. It feels to me that this problem is growing out of our control and nothing can turn it around until it climaxes, probably in some form of violence and tragedy. I hate to use this word lightly, but a lot of this rhetoric sounds like treason and mutiny to me. Heather and I had a long debate last night. She’s a Canadian liberal, social progressive and ranted about all the core problems with America: over-powered lobby interests, financial greed, and an overall national character trait of me-me-me are the root problems in America. I argued that while I agree with a lot of her points, NOW is not the time to start picking the country apart. We are in the midst of several real national crises and this is the time for people to come together, support the government, not attack it, and solve the problems. We all learned this in Kindergarten for goodness sakes! This does not mean to roll over and accept everything the government says! Rather, it simply means that we all need to appreciate how grave the situation is, try to be constructive, and realize that these people are doing their best. Man, I sound like a conservative! 🙂 Remember how England came together during WWII? I have a feeling that a lot of conservatives feel that the liberals did exactly the same thing during the eight-year Bush presidency, i.e. completely destructive and divisive tactics. It’s payback time! But, I honestly feel that things are very different and hope that this does not need proving (i.e. Iraq war was a lie, actual civil liberties reductions, lack of transparency, adversarial attitude with outsiders and rest of world, financial deregulation, etc.). But, I’ll bet that many of the extremist conservatives are rationalizing their bad behavior this way. But seriously, if you’re gonna criticize Obama, you only have a few public policy issues to point at. First, is the health care law. But, anyone who actually takes the time to read the details knows that this health care law is actually quite conservative, and in fact looks almost identical to the plan offered by the GOP a few years ago. It’s nonsense to call this socialist. The next thing that one might criticize Obama for is the economy. But, just like health care, his actions have paralleled exactly what the Republicans were doing and would do if they were in office. It’s the safe and conservative approach. It’s truly hypocritical for conservatives to bust on Obama for this, especially considering he inherited it from the GOP! Of course, the conservative argument is that Bill Clinton is the guy to blame since he also contributed to federal deregulation of business. But, seriously, does anyone have any doubt why we’re in this economic mess? It’s a result of the conservative principle of “let business do its thang and everyone else will benefit.” It’s their mantra for goodness sakes! It does not take a genius to see that this principle can be carried too far. BTW: I am a big fan of free markets and some libertarian positions, but clearly now is the time for directed action by the federal government (you don’t expect the free markets to fix it, do you?). Let’s loosen things up after the crisis is over. And lastly there’s the Gulf oil spill. It’s hypocritical for conservatives who have been calling for more US offshore drilling to criticize Obama for BP’s mistake. Ok, so if its not his fault for creating the problem, let’s attack Obama for not fixing it fast enough. How lame! The last big ticket issue is Financial Reform. How is it possible for conservatives not to see the need for this after what happened in 2008? And frankly, the current bill is quite weak and really does not go far enough to prevent another meltdown of this type. Seems to me the conservatives are all about destroying Obama, regardless of what his policies are (even when they are quite close to GOP positions)! And, that really can’t be good for the country. Side note: I’ve worked for a lot of different high-tech companies and there is always a lot of opinions and disagreement on strategy and execution. This is normal. I have observed that the companies that make decisions and execute them, without grousing or “I told you so” mentality, are the companies that succeed. Of course there are rare cases where you gotta go ballistic, but these are reserved for criminality and major ethics violations. Otherwise, you get with the program, even if you disagree and execute at 100%. I find there’s something liberating about the clarity and consensus of a plan that everyone supports and does not second guess. So, my point is that our country is in crisis, our leader is trying his best to lead us out of it, and it’s time to work together. Continue to disagree, improve the solutions, participate, make it better, but do not destroy the conversation, make up loony accusations, and turn it ugly. btw: It’s kinda funny that I consider myself to be a “social liberal, fiscal conservative”, and for the most part, still do. But, right now, our country needs some major healing (economic, energy, and education policy). And, if the policies needed in desperate times oppose my everyday positions, I can get behind it. Obama is taking away our personal liberties. => Complete nonsense used to incite anger in lower-income folks. Obama’s health care is socialism. => Man I wished it were, but it’s not. The health care bill is practically identical to the GOP proposal from a few years ago. It’s extremely weak and just a start. It’s nothing close to the successful systems used in Europe and Canada. Obama has ruined the economy. => Come on, this is just nuts. Bush’s wars debt and GOP deregulation caused it. Obama should not have bailed out the banks. => Yeah, right. And, let the world economy meltdown? No sane economic expert or leader would do this. Pure nonsense. Obama is leading a fascist government. => WTF! This is really nutty stuff with no substance. Obama is a radical. => I wished he were more of a radical! But, the facts are quite clear and the guy is another centrist democrat that could run as a Republican in some states. Lastly, the personal attacks on Obama’s character just make no sense to me. Nothing about this man seems evil, false, incompetent, or insincere. He came into office with the strongest anti-partisan attitude of any president in recent history. He sincerely reached out to the GOP and tried to find common ground (well documented), but was strongly rebuked. He paid for this by looking weak and sappy. I think the guy truly prefers to work with his opponents than fight them, but the GOP just can’t seem to find it in themselves to work with the guy. America is suffering as a result of their childishness. 1863 Copperheads = 2010 Tea Party? I recently re-watched Ken Burns’ The Civil War (thanks to NetFlix). I was stunned when the story turned to the Copperheads and Sons of Liberty. The language and beliefs of the 1863 Copperheads/Sons of Liberty is almost identical to the Tea Bag Party of 2010! If you take the time to dig in, you will be floored. I noticed this photo on a guy’s Facebook feed. There were over 6,000 comments and I proceeded to read a bunch. I was flabbergasted. There were a lot of Texans posting about how much they miss and love George Bush. There was also a lot of very nasty stuff about President Obama. And, there was a lot of quotes from the Bible. It really stuck with me: the volume of comments, the anger from white Christians, the many incorrect facts, and how they are not interested in a dialog. IMO: This is the most important conversation in America right now. It’s frightening. And, to be clear, the frightening part is that many conservatives are dedicated to actively stopping progress at all costs. Their cause has become “Make Obama Fail!” America is in an ideological-cultural Civil War! I’m very worried for our country right now and it has nothing to do with our economy, wars, health crisis, or energy crisis. It’s about our country’s soul. Here’s the very long FB discussion. Shot these in my yard. I used HDR for extra color/vibrancy. I worship at the altar of Andy Goldsworthy. These are blatant copies of his methods. I have little to add to the ever-changing Facebook story, but I gotta say it: Facebook’s current home page is the greatest home page ever created. Seriously, it is a thing of truth and beauty. I am deeply humbled by its perfection. No kidding. The ironic part is that their home page is probably not that important for growth. But, still….. wow.